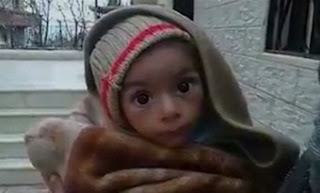 I read that a sixteen years old boy, identified as Ali, has died of starvation in the city of Madaya, Syria, under siege since July 2015, adding to the tens of deaths due to malnutrition denounced by the United Nations. My name is Ali, I was born at the beginning of the third millennium and I am, was, sixteen years old. Equally, for every day to come, I will be Ali who won. I started to defeat enemies that would dwarf adults everywhere, even with voice amplified by "keyboard cockiness" and "couch arrogance", since I was just eleven. The war erupted, at that time, as usual. Synthesized and shredded on newspaper good for fish and chip without even waiting for the next day, crumbled and reassembled in images and videos whose only special effect is the convenient likelihood. Yet, the war exploded and then started to bite life with more or less blind fury even in my invisible existence. Then I defeated fear, but it was just the beginning. Because the next year I faced and won the loneliness of a world within a world, inside another and still another one. Even if, at the end of the day illuminated by misery and stupidity, it is just one. At the dawn of the thirteen years I found myself surrounded by an army of killers among the most dangerous at any age. Read as well as the merciless devourers of hopes. They yelled and danced slobbering all together, confused among themselves as a deafening and elusive stain, vile as they are, but I never blinked an eye. Advancing, I observed them all one by one, without lowering my head even to look where I was putting my feet. So, in the only possible way, I reached the following year to see us wandering by the most dangerous of human epidemics. Indifference, that is your name. And I have ever been immune, admit it. I have called you by name and so I cast you from every centimeter of my skin. Because for people like us, who learned to survive before reading and arithmetic, remaining unscathed before the things of the world is the worst of sins. I won this time too. Because my hands are dirty, it is true, and I assume you'll understand. Dust and blood are now fundamental particles of hardened fingertips. But those blood and dust are mine, no one will ask them back, because I never thought to steal them. Today my last enemy arrived, the thousand different faces monster, but all transformed by seemingly unstoppable forces. Hunger for justice and for peace, hunger for future and for smiles. Hunger for songs on summer afternoons and racing at sunset until the heart will hurt, never really hurting it. Hunger for normality, more than anything. And, listen, I won again. My name is Ali, I was born at the beginning of the millennium and I was, am, sixteen years old. They will tell you that they I died for starvation, but they are not telling everything. Because as sure as starvation had the final say about me, my epitaph states that the hunger for food, which, even at this time is mowing life, is not my defeat.